It was awful! That is all I can say. I don’t think I will ever forget the sound of the thud his body made when it hit the hardwood floors beneath. Then, the cry … or lack there of for an excrutiating 30 seconds. His first fall and it was all my fault. Last night, after bath time, I carried Ephraim into his bedroom and placed him on his changing table as I have almost every night for the past nine months. I can admit I was a little preoccupied. 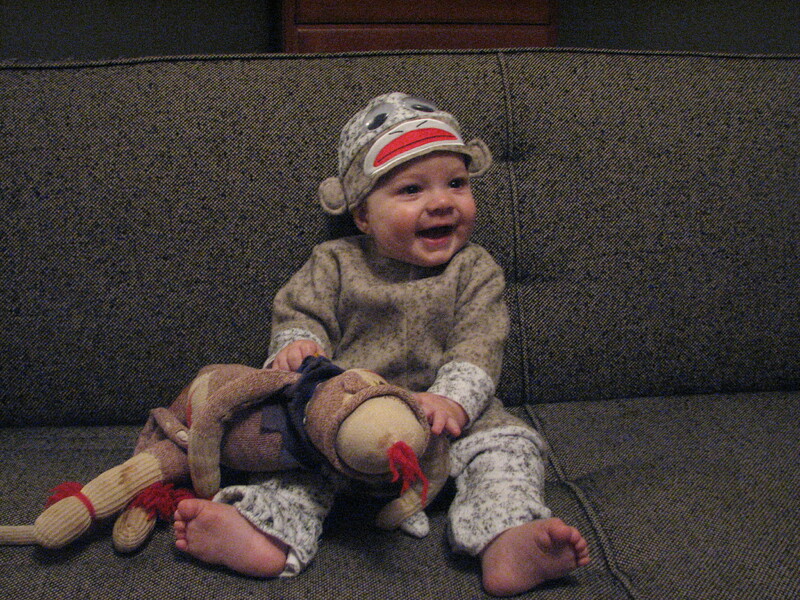 He hardly napped yesterday so he was really ready to go down for the night and we held him off as long as we could. He loves his bath, but as soon as we pulled him from the tub and wrapped him in his towel he was done. We follow the same routine every night (bath, bottle, bed) so he knows as soon he is on that changing table that he has to endure be slathered with lotion and stuffed into his pajamas before he gets his coveted bottle. I was distracted last night because our schedule was off and he has a small red bump on his hip and I cannot figure out what it is. When I carried him in and sat (that’s right I said “sat”) him on his changing table, I stepped away for two seconds to turn on the lamp so I could get a closer look at his bum. The worst part is is that I sensed it before it even happened. It was like when you know someone is about to hit another car or something, but you can’t react in time to stop it. I pushed the button for the lamp and I heard the thud almost simultaneously. My heart and stomach dropped. I quickly turned to see what I already knew, that he had fallen from the 4 footish high chest and was laying sprawled and in a silent scream on the floor. I scooped him up (Michael says I screamed but I don’t remember it) and tried blowing in his face to force him to take a breath. He did and then let out a heartbreaking scream. Again and again. I clung to him, he clung to me and we cried together. His first fall and my inability to make it all better. It was horrible. I screeched at Michael to get the phone and call my sister, Alexis, who is a nurse and ask what to do. My first thoughts were not of broken bones but concern about a possible concussion. She was very reassuring in explaining just how resilient they are, soft bones that don’t break easily. She told Michael about the many falls her kiddos have had and it is always okay. She reminded us that this would be the first of many falls, bumps, scrathes and owies to come. In my head I knew all of this, but in my heart I was so unprepared for the feelings of guilt and helplessness. 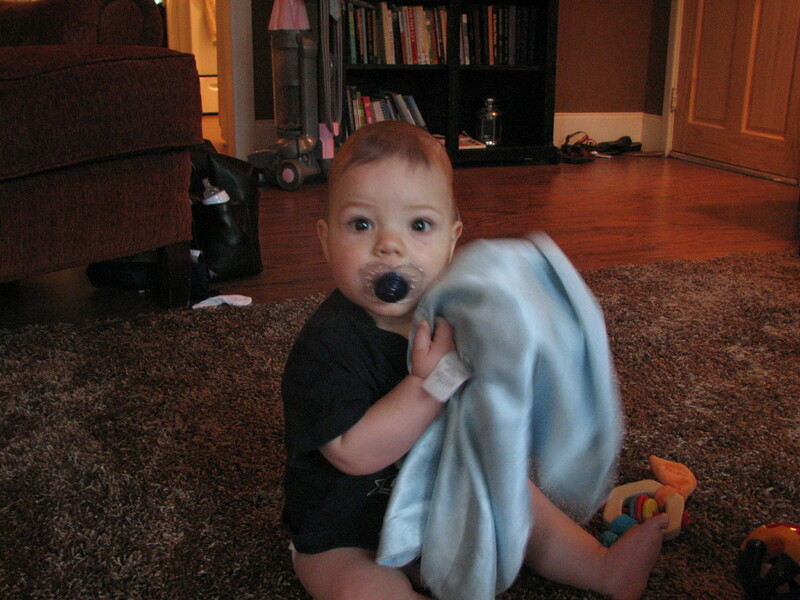 He was still crying and naked so I gently laid him on the table to diaper and dress. He clung to me so I let him and slowly got him ready for bed one handed. In the midst of this some measure of the reality of parenthood weighed on me and I was overwhelmed. I have to admit that the only thing “good” (if you can call it that) was knowing that he needed me for comfort and reassurance. 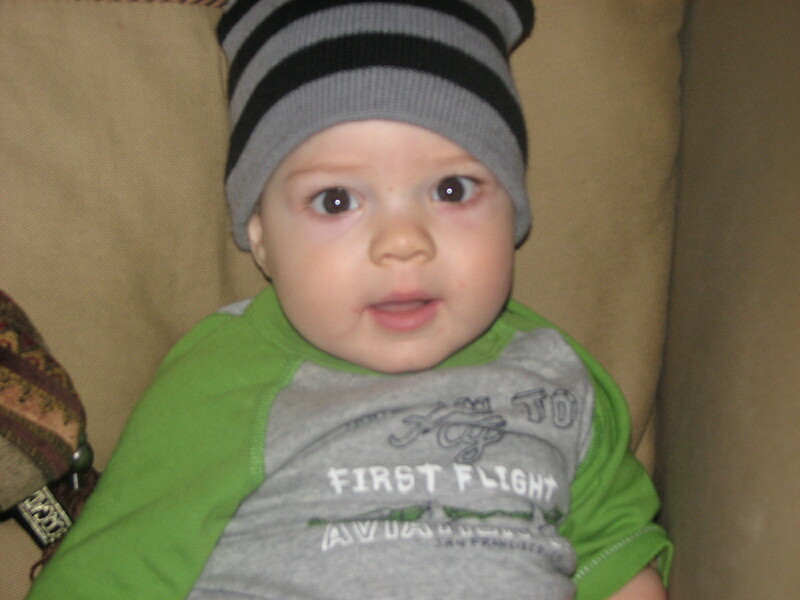 I breifly feared that I had Munchausen Syndrome By Proxy, but pushed past that and just held my little man. We fed him, prayed over him and put him to bed. Basically we just carried on with the routine. He was out instantly. Michael and I went into the kitchen and immediately opened a bottle of wine. I needed my little red friend to steady my still shaky nerves. 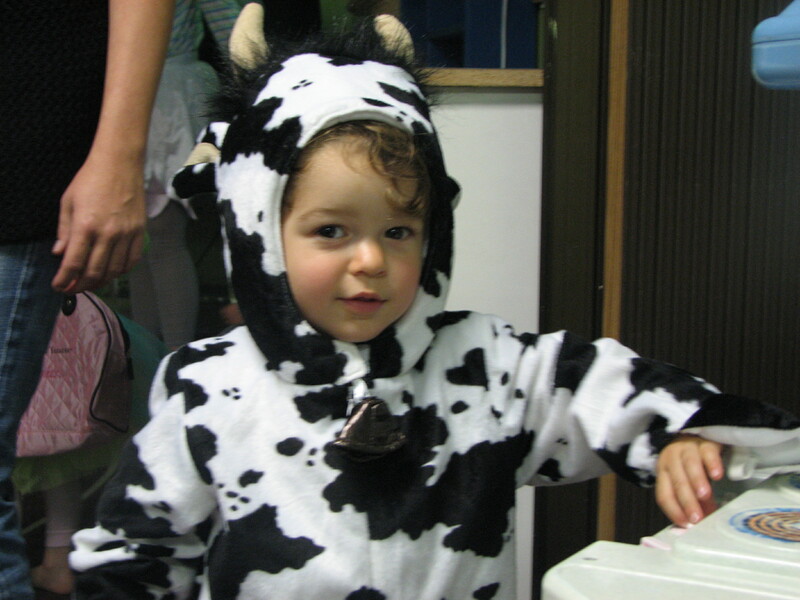 During the choas, Michael also called the pediatrician who called back and offered further reassurance. We held each other and I cried some more and realized this was probably one of the real welcomes to parenthood. It is true when they say it is not for the faint of heart. 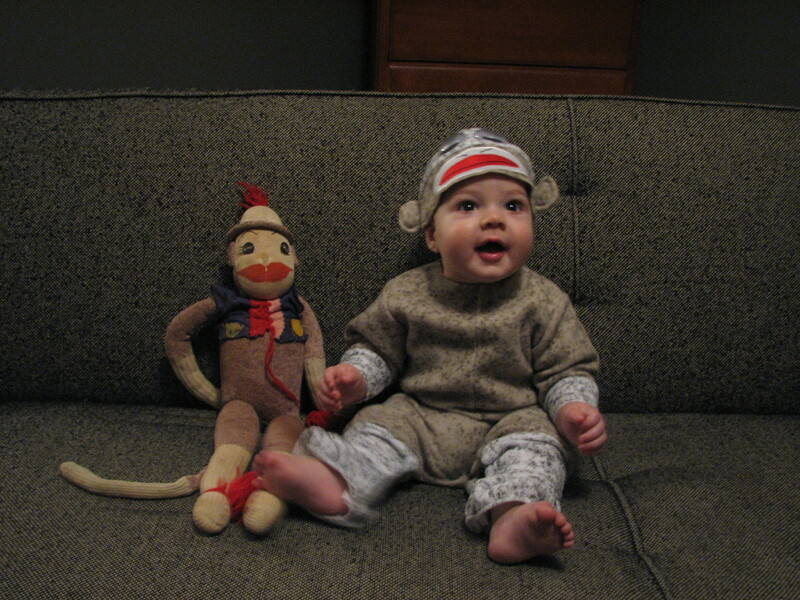 Just wanted to share some monkey love! I just finished reading “A Thousand Splendid Suns” by Khaled Hosseini. (He also wrote “The Kite Runner” if any of you are familiar with it.) The book was amazing and it touched my heart on so many levels. It is an absolute “must read” in my opinion. It is hard to pinpoint all of the poignant things about this novel, but there is one issue in particular that especially struck a chord with me that I would like to share with you …barrenness. I am sure most of you reading this know that getting pregnant was not easy for me. 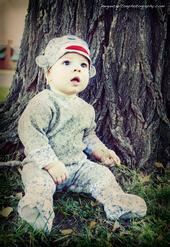 I was not one of those women lucky enough to have their husband look in their direction and whammo blammo we made a baby. We never have truly understood the nature of why conception was so slow in coming for us. The doctors never found anything wrong with us and it seems like it was just a matter of time, a long time for us. I think if I had a window into the future and knew with absolute certainty that I would eventually conceive, maybe the waiting would not have been so difficult. But I didn’t have a window and the waiting was difficult. Painful. And heartbreaking. I told Michael the other day, after reading about Mariam in the book and her own cycle of infertility, that I still feel very much like a barren woman. I think for some reason I identify more with that heart, than one of a woman whose quiver is full. After reading late into the night, just as I was going to bed, Ephraim woke up and so I decided to feed him. As he laid there in my arms, my heart became overwhelmed and the dam of emotions I have been carrying broke and I wept. My tears fell onto his face as he continued to nurse and I thanked God for this miracle in my life. It was a sweet moment, but I do not feel as though I have recovered from it yet. In the few days since this moment, I have become aware of the struggles of several couples (some we know, some we don’t) to have children. Some of these women can’t seem t get pregnant. Other get pregnant, but lose the baby shortly there after. In both cases it is a heart wrenching battle. For these women, I know, feel as though their bodies are betraying them and they have failed in some way. I felt that way too. In addition to the physical ache and longing for a child, there is the emotional saga as well. As Proverbs states so perfectly, “Hope deferred makes the heart sick”. Before you know it, your heart has become consumed by an emotional battle so entangling and suffocating that death might seem a relief. For myself, I turned so far inward that what I found was scary and lonely and selfish. I sought prayer and counsel from others, but it still ate away at my heart. Finally, after meeting with a dear friend from church she gave me words that unlocked the death-grip of grief on my heart. She said I had to make a choice and the choice was this, “REJOICE with those who rejoice and MOURN with those who mourn.” She was right. I had to stop making it about me. You see every time someone I knew got pregnant, especially if it was easy for them, I went into an emotional tailspin. I wanted to be happy for them and a part of me really and truly was, but eventually the question came …”But what about me God?” I felt forgotten and unloved. I wondered if I had committed some sin that was punishable by withholding a child. I reasoned that that could not be the case because it would unfairly punish Michael as well. So what then? Why? When? I made a decision the day that advice was given and I chose to rejoice. During this time both my sister and sister-in-law had become pregnant within a week of each other and had due dates days apart. I was book-ended by impending birth, swollen bellies, and proud papas. I am not going to lie. It was one of the hardest thigs I have ever walked through. I tried my best to hold my head high and celebrate with these women the blessings that were soon to arrive. I gladly hosted baby showers and listened with real excitement and joy about sonogram reports and feeling the babies move. I was happy for them. And when those babies arrived 6 days apart I held those bundles of joy, I snuggled them, and smelled their sweet smell. I drank it all in and waited, in faith, hoping for the day when this experience would be my own. I rejoiced, inwardly and outwardly. Along the way though this journey I began reading a book called Supernatural Childbirth by Jackie Mize. In the book, she chronicles her own struggle to conceive and carry a child to term, for she had been told she would never be able to do either. She now has four children and with three of them experienced pain free childbirth. The reason I read the book was because she researched and wrote about every promise of God in the Bible concerning conception and pregnancy. I never knew there were promises about getting pregnant. Or not miscarrying. But there are. Lots of them. So daily I began reading through these scriptures and confessing them over my womb. One really stuck out. A pocket of revelation began to open up in me that this barrenness was not God’s will or plan for me at all. His plan was established thousands of years ago when these words were written. No longer did I have to question His heart on this issue. It was there, written in black and white. When I read it I felt like God was telling me, you will someday have a son and when you do, name him Ephraim. I thought, okay. Name is kinda different, but cool. Whatever. On June 18, 2006 something happened. At church, i received a word from a man named Troy that my womb was being healed. I had similar words given in the past, but this was different. Troy is affectionately known as the “baby prophet” at our church, MORE, because he has prophesied several children, especially to barren mothers. It was the gift of faith I had been praying for. So we continued to wait. And wait some more. Whenever I was given over to doubt or despair, I would cling to the promise Troy had spoken and I prayed. On June 18, 2007 I took a pregnancy test and it was positive. One year to the day the word was given. On my birthday I found out I was carrying a boy. A son, and we named him Ephraim. It was only then that I looked up the meaning of the name. When I read those words I laughed through my tears for Ephraim means “Fruitful, Fertile and Productive”. To thin that for two years I had been telling people that if I had a son I would name him Ephraim all the while speaking fruitfulness and fertility over my empty womb. Talk about calling things that be not as though they were …. On February 18 of this year our little miracle and promise arrived (on Troy the Baby Prophets birthday no less!) at 6:54 pm. He was breathtaking and the sound of his first cry made the journey and the struggle worth it all. So here I am, nine months later writing all of this down for who knows to read and the pain still feels as real as it did then. The struggle is over, but still seems so real. I am reminded of the scripture in revelation that says “we overcome by the blood of the lamb and word of our testimony”. I guess these are the words of my testimony and I hope in some way, by sharing them they will find there way to someone else who needs a gift of faith. I think maybe when we go through something difficult, perhaps God allows us to remember some of that pain so we never forget and are able to bear one anothers burdens. I am not trying to make theology out of that, I am just saying that if this remembering must be bittersweet than hopefully it is so I can help someone else who is in the midst of the battle right now. If you or someone you know is walking this difficult path right now, please leave me a comment or email me (neagler@gmail.com) so that I can pray with you for healing and deliverance. Also, here are some recent pics! All she wanted was a pair of summer wedges! I love my mom! I do! There is so much to love about her and respect her for. She is one of the most intelligent women I have ever met. She has an amazing work ethic and thirst for knowledge. When I was in middle school went back to college and got her teaching certificate. She went on to be both a principal and a superintendant, before taking early retirement a few years back. Over the past few years she tried her hand at financial planning and even delved briefly (thank goodness) into a multi-level marketing business. She never quite found her niche so she recently went back into the working world as a director of personnel for the juvenile detention center in Amarillo. She loves her job, loves the hours and all that it entails. The main challenge for her has been updating her wardrobe to re-enter the professional world. For the past few years, since she worked from home, most of her clothing purchases have been either very comfy or just plain practical. So she needed to upgrade. Now, as I said before, I love my mom. There are many things to admire her for, but her style may not be one of them. I don’t say this to be mean, I am merely stating the facts. She is a beautiful woman and over the years my sister, Alexis, and I have had great fun dressing her up. We have taken girls trips to Dallas and hit up local sales and Mom is always eager for our opinions on things to try on and purchase. Last summer, before we took a trip to Israel, we spent a day outfitting her with new clothes for the vacation. My point in mentioning this is that my Mom respects and values our opinions, at least when it comes to fashion. So it was not unusual when, late last week, she asked Alexis and I to take a look at a few of her recent purchases. The other important thing to mention here is that my mom is cheap. Not thrifty or frugal. Cheap. She loves a bargain and often times has trouble refusing a purchase simply because it is a great deal. This has become a problem over the years as she has accumulated a few things that were inexpensive, but also hideous. This is valuable information. 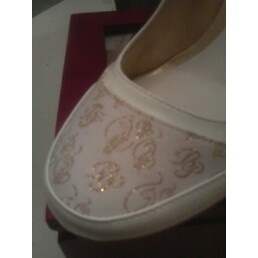 I know it is kinda hard to see, but those are pretty little gold kitty cats emblazoned all over the toe of the wedge. Some of you may recognize this as the logo for Baby Phat. This is the heel of the shoe. Now, i wish i could say that we reacted well and were mindful of my Mom’s feelings when we saw these beauties. I can’t. I blame the wine, but we burst out laughing and I made Alexis grab these pictures with her camera phone. My poor Mom. She had no clue what all the fuss was about. She just figured we didn’t like these shoes like countless others she has bought before. We explained that she could not, was not allowed under any circumstances to wear Baby Phat. She said, “What is Baby Phat?” We showed her the heel of the shoe and explained …. as best we could. All I could imagine was her walking through the detention center and getting a lot of props of some from some of the detainees for her excellent sense of fashion. Sigh! Alexis accompanied her to TJ Maxx this week and made sure the kittens were safely returned. All is well that ends well. Just wanted to share a little humor from my week. 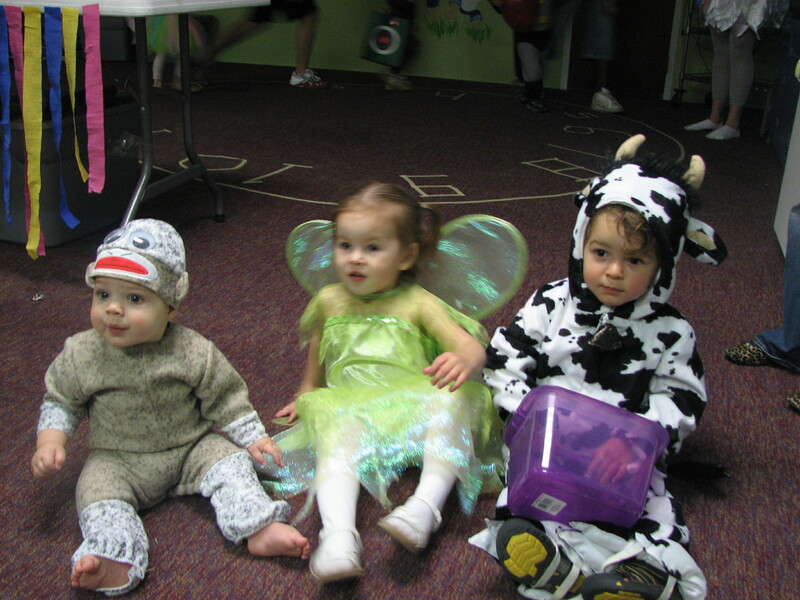 I had to post the requisite costume photos of my little one. 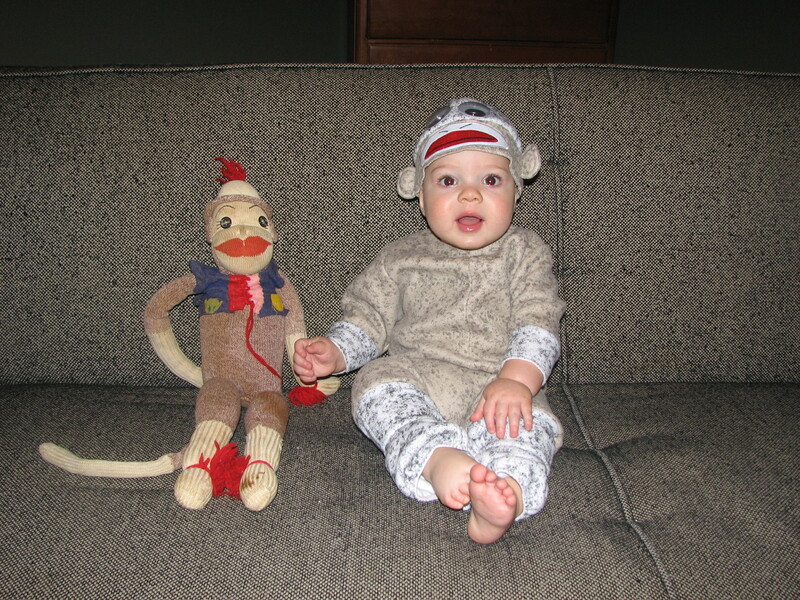 Ephraim was a sock monkey for Halloween. We spent the evening at our sweet friend Claire’s 1st birthday party and then on to Jesus Jam (an event at our church) to show off our little man. 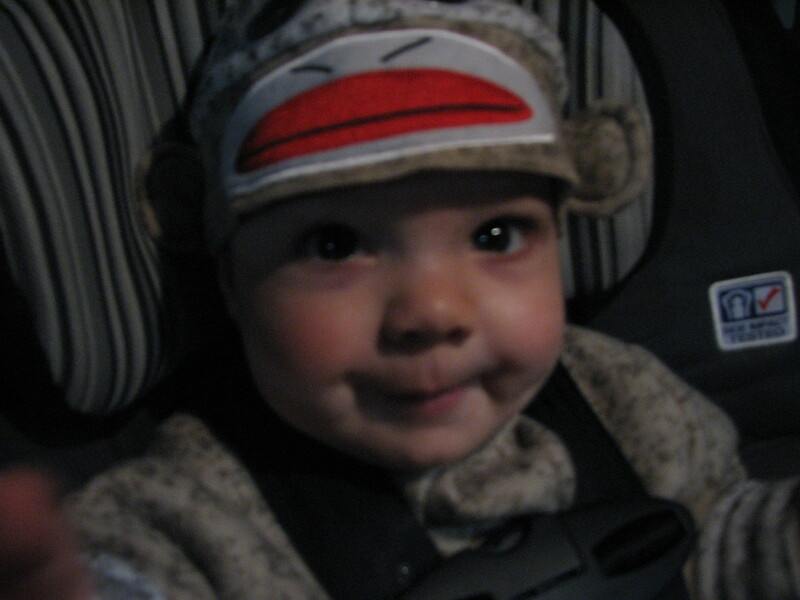 On our way home ... one tired little monkey!